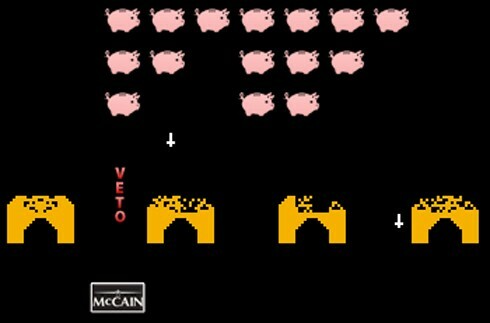 I’ve been asked to design and develop a small game for a Space Invaders-themed campaign against corporate tax evasion. The result is Tax Evaders, an iteration of the original arcade classic with excellent Amiga-era pixel art by James Biddulph and sound design by Ashton Morris. The week before Tax Day (April 15) the game has been projected guerrilla-style against corporate offices and banks in various cities around the States, together with other light interventions by groups in the post-Occupy Wall Street galaxy. The campaign, coordinated with a Twitter bombing against the main evaders’ accounts, was quite successful. I’d love to see more games (digital or not) in public spaces as enablers of playful protest. However, the game itself leaves a lot to be desired. Changing the narrative surface of classic arcade games has been the default strategy for “games with an agenda” since they existed. Take a well known gameplay and simply replace text and graphic elements to reference some “real world” relationships. 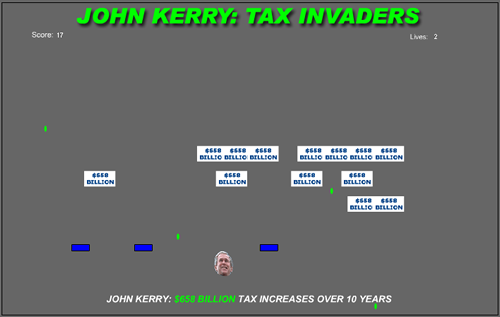 John Kerry: Tax invaders an official game by the GOP from 2004. The complementary John McCain Pork invaders from 2008. This is a straightforward gameplay-as-metaphor approach I always cautioned against, not only because it’s unlikely to produce a compelling game (the game will probably be as interesting as the original, only 20 or 30 years later) but also because it doesn’t take into account that the meaning of a game emerges from the complex, often ambiguous, interplay between the narrative/visual “surface” and the underlying game mechanics. Rule systems are meaningful or have, at least, certain biases. There are aspects of the Space Invaders’ gameplay that can’t be changed by simply replacing sprites: the conflict is a Manichean good vs evil one, the enemy is foreign, and the only way to confront the invasion is by using military force. In his book Persuasive Games Ian Bogost notes how these specific characteristics are consistent with the conservative ideological frame (taxation as theft, government as external entity…), but they can hardly support a progressive, non militaristic, non reductionist argument. Different ideas require different forms. Tax Evaders has a few twists: corporations move upwards from the city, metaphorically avoiding their responsibilities toward society; buildings representing social services are not destroyed by direct attacks like the green shields in the original game and are instead restored by tax revenues, and so on. But the military metaphor is still there and it’s a lousy representation of collective action. Moreover, the game does something I always tried to avoid in molleindustria games, which is proposing a fantasy of power for disempowered subjects. El Lissitzky – Beat the whites with the red wedge (1919). 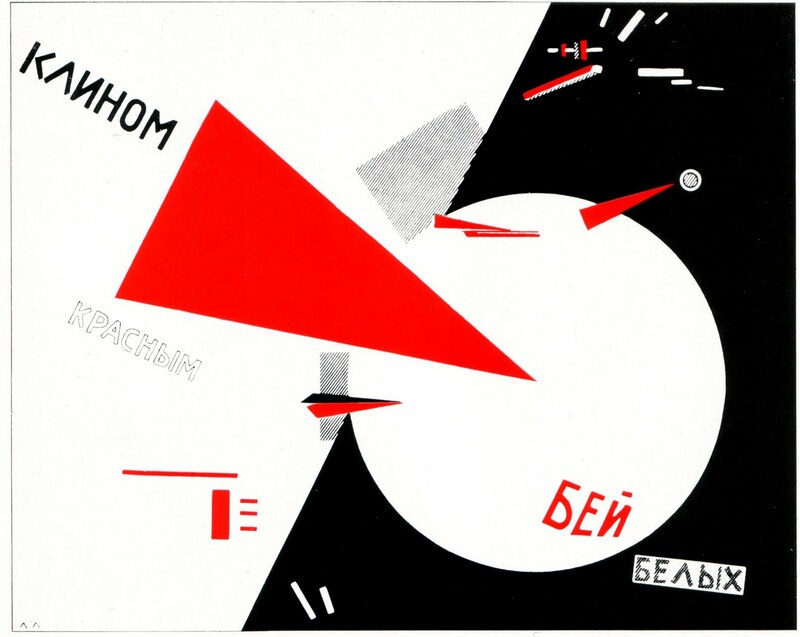 Classic piece of constructivist art from the Soviet revolution (the whites are the counter-revolutionary forces). Images of struggle have always been a part of the iconography of social movements: they can be galvanizing and they can support the idea that it’s ok to see certain people and organizations as opponents with interests that are incompatible with yours. But I fear that playing a virtual revolution may have a cathartic, soothing effect. Especially in a moment in which the issue of economic inequality has been raised, the problems have been identified by a large part of the population and the frustration from not being able to translate this sentiment into political change is widespread.